One of the most recognizable brand names in the flooring industry, Mohawk has been manufacturing top-quality flooring for more than a century. When it comes to hardwood flooring, Mohawk has built a strong reputation with innovative solid and engineered hardwood products that combine premium woods with superior craftsmanship, eco-friendly manufacturing practices, durable finishes, popular design options, and exceptional value – all backed by some of the best warranties in the flooring industry. Here are just a few reasons why Mohawk continues to be one of the top-sellers in hardwood flooring. Mohawk is committed to creating beautiful flooring products that support a healthy home environment. The company backs this promise with its Healthy Home Certification program, which ensures all of its hardwood flooring products are safe, sustainable, and manufactured responsibly, without the addition of harmful chemicals. Using its innovative PureBond technology, Mohawk manufactures its prefinished engineered woods without the use of added formaldehyde adhesives. In fact, all engineered hardwoods manufactured by Mohawk are tested in accordance with the California Air Resources Board (CARB), which regulates safe formaldehyde emissions, and meet strict CARB Phase 2 standards. Since Mohawk hardwood products do not release any harmful chemicals (VOCs) into living environments, they are also compliant with many U.S Green Building Council LEED use standards and have been certified by FloorScore as meeting the organization’s indoor air quality standards. These certifications from respected third-party organizations offer extra assurance to consumers that Mohawk Hardwoods are safe for use in their homes. Designed to perform, Mohawk hardwoods are backed by some of the best manufacturer’s warranties in the flooring industry. Many Mohawk collections, such as the Woodbourne series of traditional solid Oak, for example, are backed by a 25-year residential use warranty. Scotchgard protection: All finished Mohawk hardwoods include the company’s advanced Scotchgard protection technology that prevents most stains and spills from bonding to the wood floor’s surface. Scotchgard eliminates the need for frequent cleaning and cleaners with harsh chemicals. ArmorMax finish: Among the most durable coating systems in the industry, Mohawk’s ArmorMax finish technology offers maximum protection for hardwood floors. Unlike topical finishes, ArmorMax penetrates deep into the wood fiber, making it up to five times more resistant to wear than other extended finishes. This built-in surface shield repels stains, resists wear, and makes cleaning easy. Combined with Mohawk’s advanced Scotchgard technology, ArmorMax finished hardwoods, such as those in the American Retreat engineered collection, are so durable that Mohawk backs them with a 50-year finish warranty. DuraBeauty finish: Mohawk’s DuraBeauty technology uses intense heat and pressure to inject acrylic resins and stains directly into the hardwood, filling the porous cells. This hardened acrylic finish offers 50% more crush-resistance than found in traditional wood floors. Additionally, injecting the wood stain into the fiber of the wood itself produces permanent, beautiful color that won’t wear off. Mohawk backs its DuraBeauty finish with an extended 35-year residential finish warranty and a 3-year medium commercial warranty. Mohawk hardwoods are not only made with superior craftsmanship for long-term wear, they are also among some of the most beautiful hardwoods. And the design possibilities are limitless. 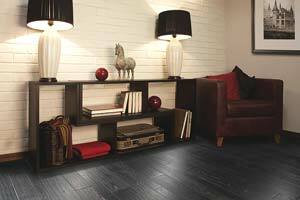 From traditional hardwood looks to today’s most contemporary styles, colors, textures, board widths, and lengths, Mohawk has the look to match most any decorating style. In addition to Mohawk’s large selection of popular domestic wood collections, the company also offers many exotic collections, such as Bahia Tigerwood and Hilea, a collection of wide 5" x 3/8" solid Bamboo, for a truly unique and highly durable design option. 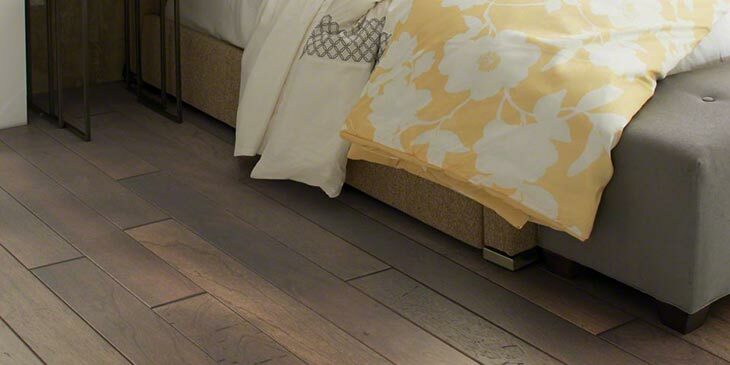 Mohawk’s premier Uniclic tongue-and-groove locking system offers a quicker installation that eliminates the need for adhesives and minimizes the mess associated with traditional glue-down hardwood flooring installations. With Uniclic, there’s no waiting for glues to dry, so floors can be used immediately following installation. The unique locking system is secure and tight, which also eliminates the potential for unstable or uneven flooring. Backed by a lifetime locking system warranty, Uniclic floors, such as the hand-scraped, rustic Brandymill engineered series, offer unmatched protection against spills and moisture. By combining meticulous craftsmanship, premium selected woods, and revolutionary eco-friendly processes, Mohawk hardwood flooring offers you many stylish options for your home with the performance you can trust. Take a look at our many Mohawk hardwood collections to see why Mohawk is one of the industry’s best-selling hardwood brands. Have questions about a Mohawk product? Contact us. 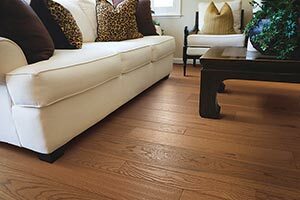 We’d be happy to help you select the best hardwood flooring for your needs and budget.